The last few weekends have been absolutely beautiful here in El Paso, Texas. Let’s hope it stays that way for a while as it’s been quite a bit warmer than we expect this time of the year. This weekend’s enjoyment comes in the form of a MBombay Mora Lancero paired with a bottle of Unibroue La Resolution. 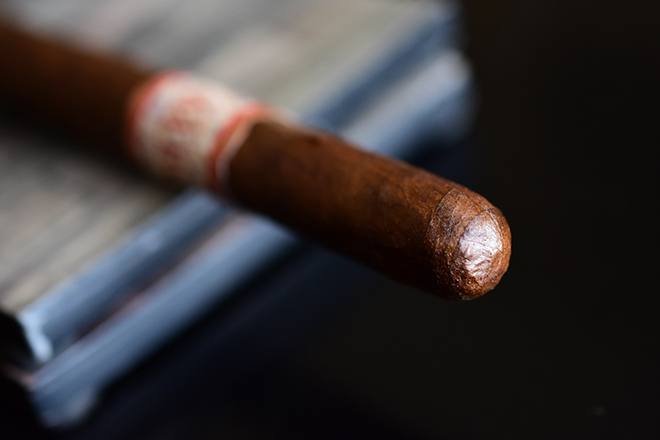 Bombay Tobak’s MBombay lines are no stranger here on Casas Fumando. Today with take a look at the Mora Lancero with is one of five standard production lines in the MBombay portfolio. The Mora line made it’s debut in 2014 with line expansions each year after. The line now features eight different vitolas. The No 4 (5.1 x 44), Robusto Larga (4.5 x54), 585 (5 x 58), Saloman (6 x 58), Torpedo No 2 (6 x 52), Toro (6.5 x 52), Lancero (8.5 x 38), and the A (9 x 47). 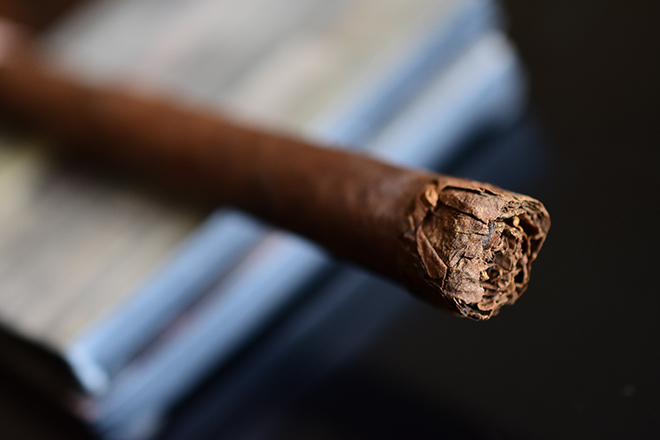 The blend features a Dominican Republic Corojo wrapper, Ecuadorian binder, and fillers from Ecuador, Peru, and the Dominican Republic. Each lancero runs $13.30 a stick and are available at retail stores across the U.S. now. Big thanks to the MBombay team for sending a few of these our way for review. The MBombay Mora Lancero is an absolutely stunning cigar. It starts out with a very deep, consistent, dark brown wrapper. 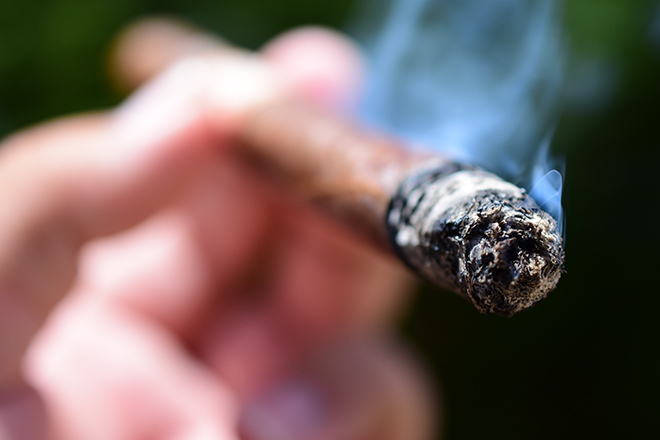 The wrapper’s texture carries a decent amount of tooth, some smaller veins, and a whole mess of thick oil that rubs off on my fingers as I inspect the cigar. 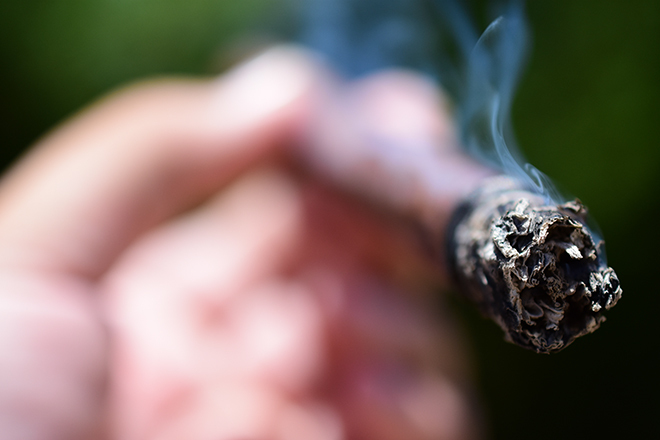 The wrapper is very thick and dense while the entire cigar feels nice and firm considering the smaller ring gauge. 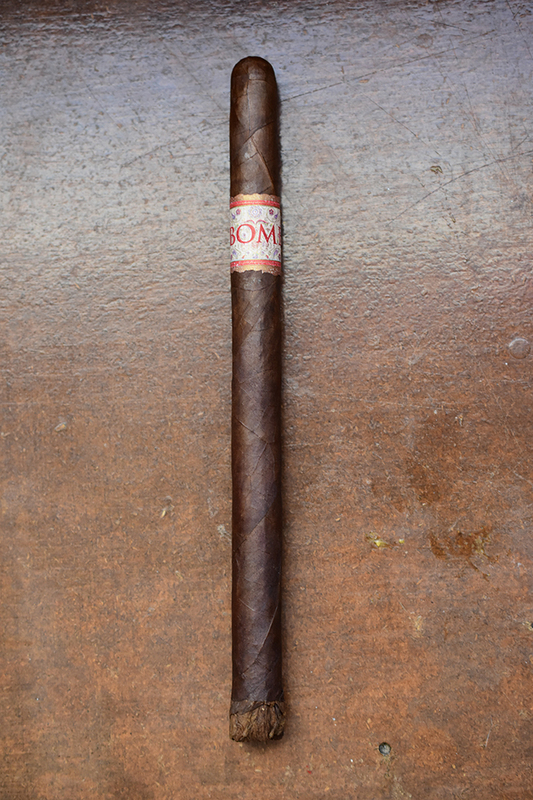 The Mbombay Mora Lancero carries a gorgeous unfinished, shaggy foot, and a pointy, round double cap. The construction and overall look of the cigar is incredible. Lastly, the cigar is polished off with a standard red MBombay band. 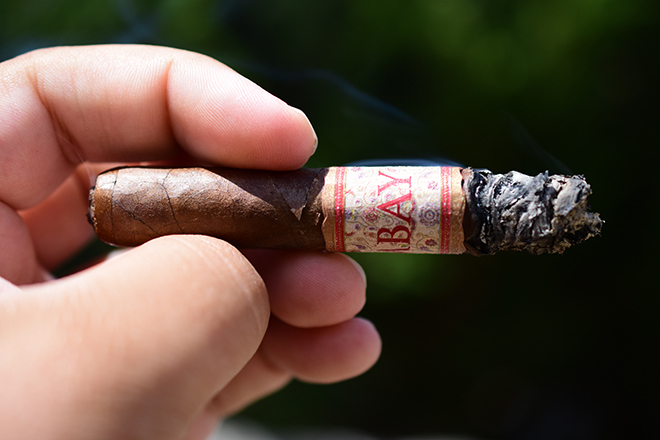 The wrapper on the MBombay Mora Lancero gives off a great amount of spice, cedar, and sweetness while the foot of the cigar is much more natural with tobacco, earthiness, and even more spice. The cap cut extremely clean and easily using my Xikar double bladed cutter. The cold draw produces a wonderful spice, floral flavors, and a great sweetness over some natural tobacco flavors. The MBombay Mora starts out with a very nice black pepper blast that only lasts for the first few puffs before settling down revealing some great spice, ginger, cedar, and plum. Once I burned through the unfinished foot and hit the wrapper a good amount of sweetness and cocoa entered the mix. The cigar is starting out with a great amount of body already. The draw is flawless while the burn line is razor sharp and surprisingly solid. Usually I have issues at the start of cigars with unfinished feet. The ash left behind is pretty flaky and a dark gray in color holding on for about 3/4 of an inch before giving way. As I smoked through the second third of the MBombay Mora the subtle cocoa I picked up in the first third really starts to take lead in the flavor race with cinnamon and spice right behind backed by the ginger, cedar, and plum. The retrohale showcases a bold spice along with some nice mellow oak. The burn line is solid, and sharp while the cigar does tend to want to go out if I don’t give it attention, but I have yet to reach for my torch so I’m not complaining. I close out the second third with absolutely nothing in the nicotine department. And now into the final third of the MBombay Mora Lancero the spice has really ramped up and is leading the charge backed by sweetness, cinnamon, plum, cocoa, and cedar. The cigar took me 2 hours to take down to the nub and I loved every second of it. I close out the cigar with no harshness, no extra heat, and a decent little nicotine kick although the beer may have a lot to do with that one. 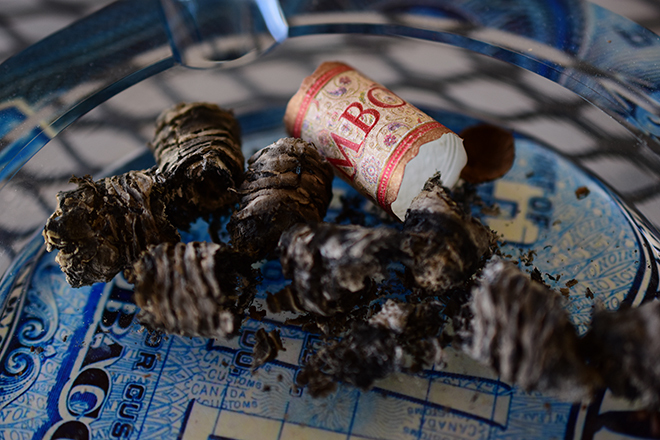 We’ve been fans of MBombay since they hit the market, and so has just about every other blog out there. The Mora Lancero was no different, and in all honestly probably my favorite offering I have had by the company. The bold flavors were incredible, the changeups were great, the cigar was complex, and not overpowering while it burned like a dream. Not much more to ask for in a cigar. The price is a bit steep, but the cigar burned forever, plus it was as long as my arm. Unibroue is a Belgian style brewery housed in Quebec, Canada and is by far my favorite Canadian brewery. 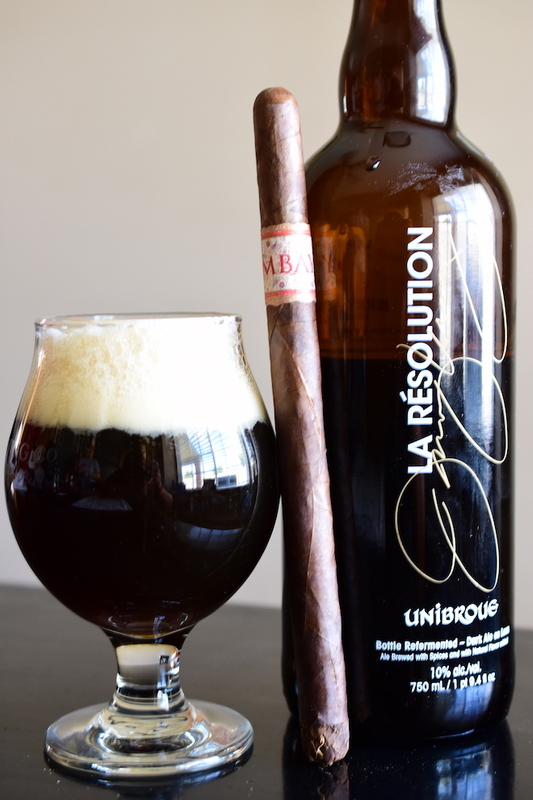 La Resolution is a Belgian style spiced, strong dark ale which comes in at a whopping 10% ABV. The beer has been available in Canada but only recently hit the United States in very limited quantities. The beer starts out with some great tartness, plum, cherry, bold spice, cinnamon, and caramel with a very light mouthfeel before finished crips with even more cherry, apple, strong spice, cinnimon, sweetness and all around deliciousness. This is a damn good beer. It’s easy to see why I chose it to pair with the MBombay Mora too, the sweetness, plum, cinnamon, and spice married up brilliantly with the flavors in the cigar. This was a match made in heaven.